This work is a collaboration with Prof. Ed Colgate, Prof. Michael Peshkin and Gabriel-Aguirre Ollinger of Northwestern University, Evanston, Illinois. We present a novel form of lower-limb assist, consisting of making the human limb interact with an exoskeleton that displays active mechanical impedance. Our overarching goal is to develop a control method for exoskeletons that provides sufficient flexibility to assist a wide variety of lower-limb motions, such as can be encountered in activities of daily living. Our approach to human assist is based on enhancing the kinematic response of the human limbs. Exoskeleton designs can be classified in terms of their assistive capabilities as either passive or active devices. Exoskeletons that display passive behavior assist human users mainly by helping them employ their own muscle power more effectively, but do not actually supply energy to the user. In passive gravity support, an unactuated orthotic device can provide partial support of the user’s weight by forming a mechanical path to the ground. Gravity balance of the freely-moving leg using springs has been implemented by other. Load-carrying assist is a special case of gravity support, typified by the BLEEX system, in which the exoskeleton supports a load carried by the user. The exoskeleton’s controller uses positive kinematic feedback to scale up the device’s mechanical admittance, however, the device remains passive in its interaction with the user. Our work focuses on active exoskeleton assist. An active device is one that can behave as a continuous energy source. Probably the most common approach to active assist is using the muscles’ electromyographical (EMG) activity to control the actuators of the exoskeleton or orthosis. The above figure shows a model of a 1-DOF exoskeleton designed to assist the motion of the knee joint. For the case of linear behavior, this device can be modeled as a linear time invariant second-order rotational system. 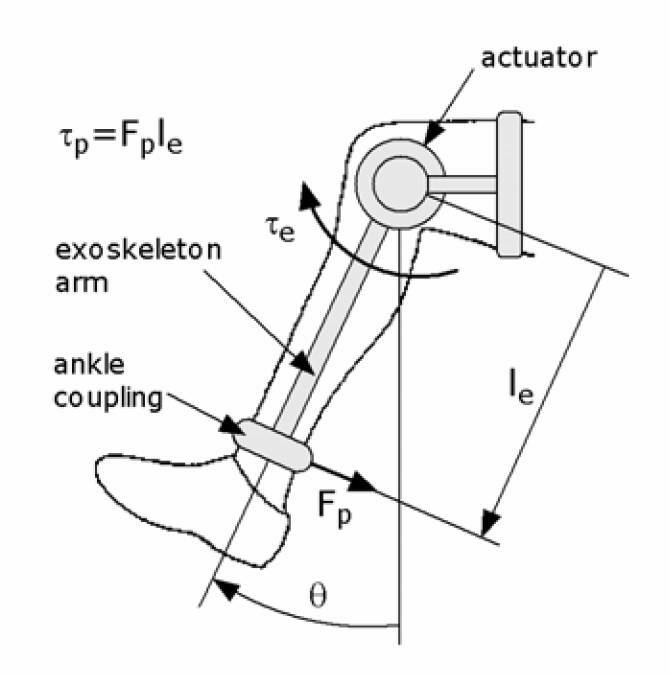 The above figure shows the coupled system formed by the exoskeleton’s virtual impedance and the human limb. For simplicity we are assuming the coupling between the exoskeleton and the human to be rigid. We propose using the virtual modification of the lower limb’s impedance as the primary source of human assist. The present study focuses on the use of negative exoskeleton damping, which is a particular case of active-impedance control. Because natural damping is an energy dissipation term, it makes sense to consider negative damping as a way to source energy from the exoskeleton to the user. 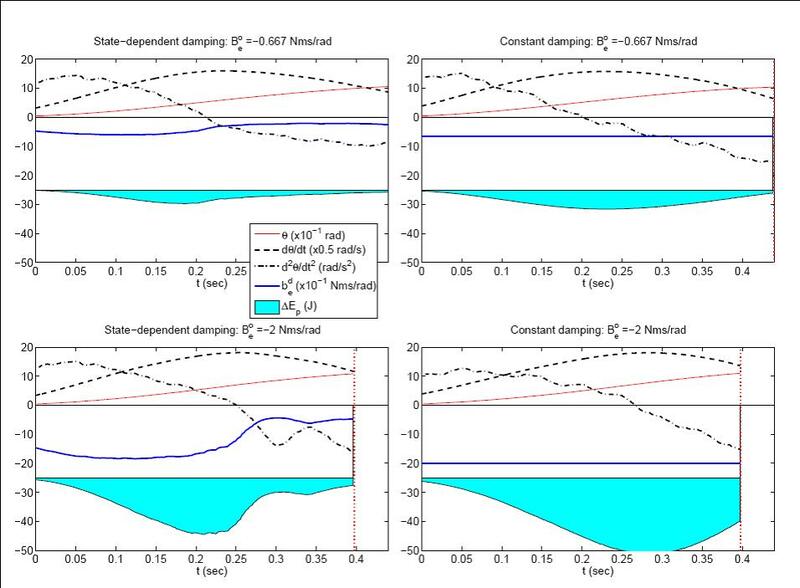 Furthermore, since damping is a velocity-dependent effect, the exoskeleton-human interaction forces generated by negative damping become nearly zero when the leg is at rest or in quasi-static motion. The general admittance controller used for our system. For the actual implementation of the exoskeleton we have chosen an admittance control scheme : a torque sensor measures the interaction torque between the exoskeleton and the user, and uses it to issue a trajectory command. Our experimental platform is a 1-DOF exoskeleton mounted on a rigid base(see figure below), designed to assist a person performing knee extensions and flexions. A custom-built ankle brace couples the user’s leg to the exoskeleton arm. The arm’s construction has been made as lightweight as possible in order to minimize its inertial effects. The ankle brace is mounted on a sliding bracket in order to accommodate any possible radial displacement of the ankle relative to the device’s center of rotation. The 1-DOF exoskeleton is designed for high backdriveability; to that purpose we have chosen to employ an AC servomotor with a large torque capability, and a low-ratio cable-drive transmission. The main advantage of the cable drive is the elimination of transmission backlash and friction, both of which can be a hindrance to impedance control, especially in the active region. The cable drive is similar in concept to that of the PHANToM haptic device. A potential disadvantage of this type of transmission is axial cable compliance, which limits the bandwidth of the mechanism. 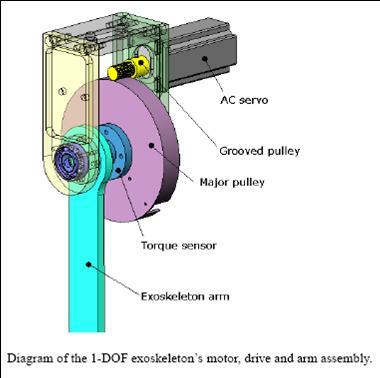 However, since typical lower-limb motions occur at low frequencies, the bandwidth requirements for this application are not particularly demanding.The figure below shows a detail of the exoskeleton’s main assembly, consisting of the servomotor, the drive transmission and the exoskeleton arm. The motor is a brushless direct-drive AC servo with a power rating of 0.99kW and a continuous torque rating of 2.0Nm; it features an emulated encoder output of upto 32,768 counts before quadrature. The transmission ratio of the cable drive is 10:1, thus allowing a continuous torque output of 20.0Nm. Abstract: We propose a novel control method for lowerlimb assist that produces a virtual modification of the mechanical impedance of the human limbs. This effect is accomplished through the use of an exoskeleton that displays active impedance. The proposed method is aimed at improving the dynamic response of the human limbs, while preserving the user’s control authority. Our goal is to use active-impedance exoskeleton control to improve the user’s agility of motion, for example by reducing the average time needed to complete a movement. Abstract: We propose a novel control method for lower-limb assist that produces a virtual modification of the mechanical impedance of the human limbs. This effect is accomplished by making the exoskeleton display active impedance properties. Active impedance control emphasizes control of the exoskeleton’s dynamics and regulation of the transfer of energy between the exoskeleton and the user. Its goal is improving the dynamic response of the human limbs without sacrificing the user’s control authority. The proposed method is an alternative to myoelectrical exoskeleton control, which is based on estimating muscle torques from electromyographical (EMG) activity. Implementation of an EMG-based controller is a complex task that involves modeling the user's musculoskeletal system and requires recalibration. In contrast, active impedance control is less dependent on estimation of the user's attempted motion, thereby avoiding conflicts resulting from inaccurate estimation.